Enough with the cooking at home! At this time of year, by the time I am done baking for presents and cooking for pot lucks and prepping for parties, frankly, the idea of getting dinner on the table just sends me into chaos. And I don't know about you, but my next travel vacation isn't scheduled until summer. Most of the people I know aren't traveling right now, and if they are, it is to visit family. So here is my recommendation for the kitchen-weary among you, who might be pining for a little vacation. Go on a culinary adventure. 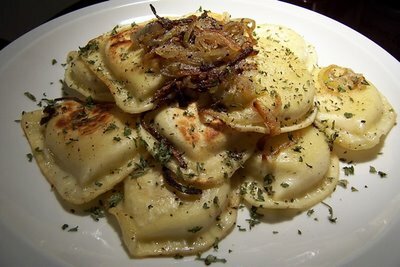 Find the cool out of the way place specializing in Polish delicacies and taste every varitety of pierogi they sell. Hit Chinatown and eat at the little place around the corner from the famous place, and commit to at least half of the things you order being things you've never tasted before. Hit an Ethiopian place and eat with your hands, head to Greektown and try the grilled octopus, or find out what all the Cuban Sandwich fuss is about. And if the weather is evil and leaving the house unthinkable? There is nothing wrong with popcorn for dinner. Pop an extra-large batch, grab something to drink, and settle in with a movie or your favorite television shows. How do you battle the dinner rut? I battle the dinner rut by finding people to cook for. Normally, on Saturday I make a crock pot full of soup for hubby and I to eat for the first few days/nights of the week. Lunches are normally sliced deli meat (nitrate free, hormone free, etc), fresh cut veggies, fruit and nuts. We eat a primarily Paleo Diet and it's fun to try and come up with Paleo friendly items that work for a non-Paleo crowd! For instance-- mini quiche for breakfast (without dairy! ), sweet potatoes with pineapple, cinnamon and walnuts, seafood salads and other yummy tids and bits. Not to say that I don't LOVE your strategy!! I love going out and trying new things and new places! I just got through with my holiday cookie-making weekend (10 dozen cookies, 4 batches of fruitcake and 12 dozen salted caramels). Knowing I wouldn't want to cook lunch/dinner on top of all that, I ransacked the salad bars at Whole Foods Friday afternoon. A little deli meat, some good bread and an assortment of fresh fruit kept hubby and I in Good Eats all weekend. The expense was totally worth not resorting to potato chips and toast for 3 days!